This entry was posted in Blues, Jazz, Rhythm & Blues, Soul, Funk and tagged 2017, 2017 albums, 2017 releases, album review, B.B. 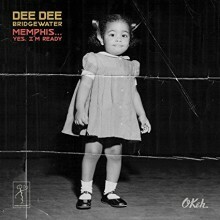 King, CD, Dee Dee Bridgewater, Eddie Bowman, funk, Memphis, music review, Okeh, R&B, Soul, Yes I'm Ready by aaamc. Bookmark the permalink.